The perfect wedding ring does not come along very often. Although colorless diamonds have been popular in women’s engagement rings and wedding bands for hundreds of years, men are demanding diamonds in unparalleled numbers. Discover our 6mm Benchmark palladium men’s diamond eternity wedding ring, a unique and timeless ring fitted for a contemporary man of any style or personality. Palladium is an excellent alternative to precious metals such as platinum or white gold. If you are searching for that perfect white hue, palladium is a naturally white metal that will never yellow or lose its alabaster sheen. 36 brilliant diamonds total to a combined carat weight of 0.72, offering just enough flare to add a touch of sophistication to any look. 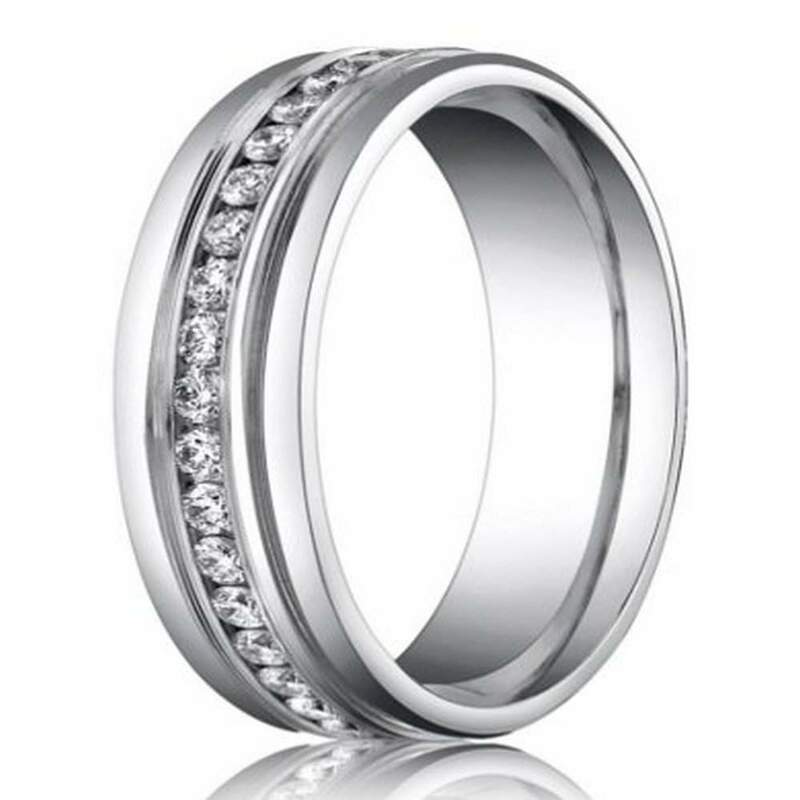 At an affordable price, our Benchmark palladium men’s diamond eternity wedding ring may be just the ring you are looking for. The comfort-fit band of our 6mm Benchmark palladium men’s diamond eternity wedding ring is ideal for any man who works with his hands throughout the day. Whether trimming the hedges or shoveling a sidewalk full of snow, this cozy band features a slightly domed interior profile to offer optimum comfort when sliding over large knuckles. You will also fall in love with the polished, round edges that showcase the essential beauty of the sparkling white diamonds. Who said diamonds were only a girl’s best friend? Make your wedding band much more meaningful by adding a personalized engraving before ordering your Benchmark palladium men’s diamond eternity wedding ring today!